10-year-old Sota lives with his grandfather and a dog named Chibi in a small snowy village. They live in such a poverty that Sota cannot even afford to go to school, but however hard the situation is, Sota never holds a bad feeling against anyone around and keeps his dream alive to become a painter. He has been friends with Sayo, a girl brought up in a wealthy family, ever since they were little despite the difference of their family position, which Sayo’s father has uneasy feelings against. In spite of the difficulties he faces, Sota manages to complete a piece of painting which he wishes to give Sayo. He and Chibi goes down a snowy night path to Sayo’s house to find that her father’s storage is on fire... What waits for Sota and Chibi gently reminds that genuine happiness always exists in your heart. Azet Nov 22 2015 4:13 pm Aooooowwww, I want to watch this movie...!!! akira Jun 15 2010 1:17 am does anybody know where to watch this english subbed?! pleeeeeeeeeeeeeeeeeeeeease! onegaishimasu! 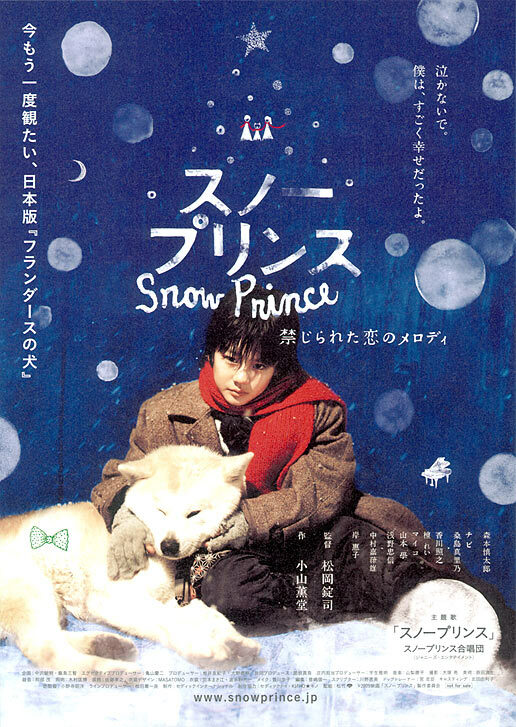 shintaro Mar 29 2010 12:09 am based on the dog of flanders novel, this movie has literally the same plot. Very disappointing movie since theres no change in the ending from the original. You had figured they will give a satisfactory ending given how much the boy suffers throughout the movie, but no if ur expecting the typical fairy tale ending.